Chen Peng (3rd from the right), Director and Editor-in-Chief of China Science Daily, signs the strategic cooperation agreement with Zhan Qimin (3rd from the left), President of PKUHSC. 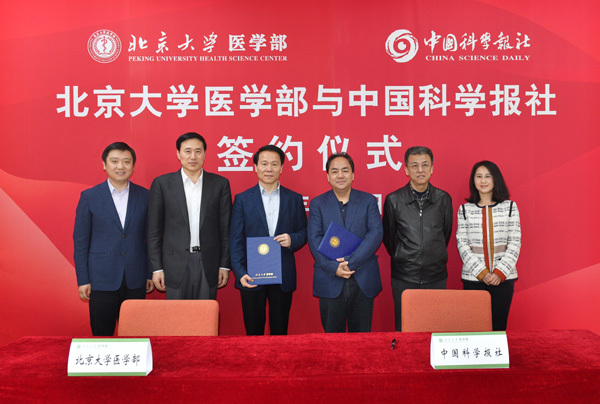 On April 1, Peking University Health Science Center signed a strategic cooperation agreement with China Science Daily so as to make full use of their respective resource advantages, devote themselves to the development and spread of the cause of health care, and facilitate the construction of the Healthy China. 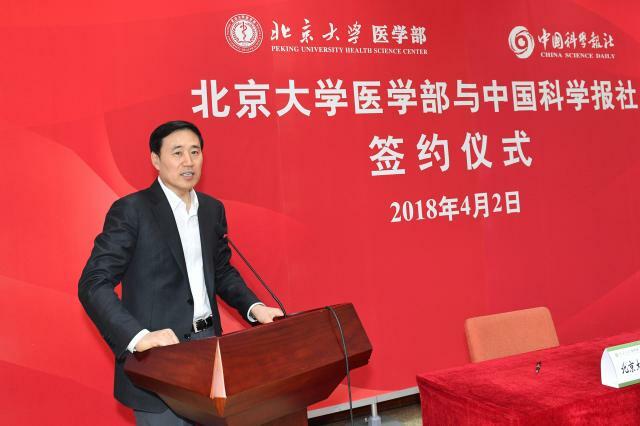 At the signing ceremony, Liu Fengsong, Party Secretary and Vice Director of China Science Daily, introduced to the floor that the newspaper was established in January 1959, initiated by Guo Moruo. Presently, the media group owns two newspapers (China Science Daily and Internet), two websites (www.sciencenet.cn, and www.cas.cn, the official website of Chinese Academy of Sciences), and two magazines (Science News Biweekly, and Science Life Weekly). 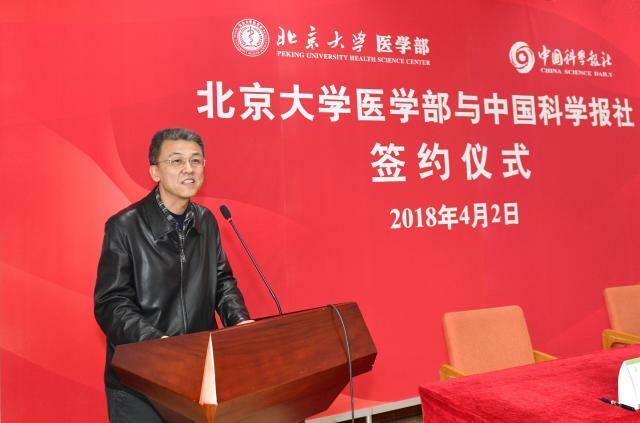 Zhan Qimin, Vice President of PKU and President of PKUHSC, commented in his speech: “The strategic cooperation of the two sides will promote the development of Healthy China in a new way. Both can voice their stories, telling about PKU medicine and Healthy China, so as to increase national health literacy. 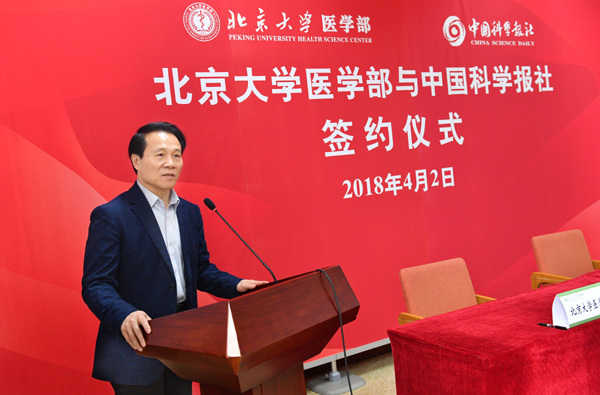 Liu Yucun, Deputy Party Secretary of PKU and Party Secretary of PKUHSC, introduced the background of the agreement on strategic cooperation and expressed the anticipation that through the in-depth cooperation, PKU medical professionals’ scientific literacy could be enhanced and the social influence of PKU Medicine could be expanded.